Ever since I read the line, “What if what we experience close up is real, and what we hear on the news and from the mouths of politicians who are jockeying for power needs to be questioned? 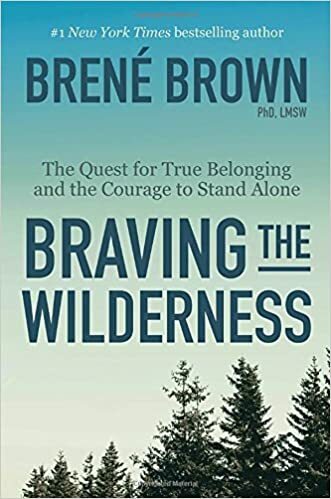 '” from Brene Brown Braving the Wilderness, I can’t stop thinking about it. The statement, supported in the book with anecdotes and specific examples, has made me keenly aware of the people in my life who I love, but disagree with. When someone is sharing an opinion I disagree with I now think to myself, “this is what Brown was talking about.” A while ago our former neighbors stopped by and surprised us with a visit. Over the course of catching up, the conversation slid ever so slightly into the topic of politics. I know this couple is much more conservative than I am, so I was not surprised to hear their take on the state of our nation. However, all I could think about in that moment was Brown’s quote and all the things I love about this couple. In fact, I didn’t want to disagree or argue, because this is a relationship I care about. And I know that, while we may have different opinions on immigration policy, for example, if faced with helping an immigrant family, this couple would be the first in line. This is my real experience, close up. This is not a study, a generalization, or a rant from a talking-head on TV. THIS is what matters. Shortly after the Parkland shooting my Facebook feed and work lunchroom conversations were usurped by gun conversations. Being a liberal, a pacifist, and a person who has never even touched a gun, I was quick to align myself with the anti-gun-at-any-cost crowd. It reached a point where I couldn’t even fathom what these “gun nuts” were thinking. Why did they care so damn much about their guns? So I asked. I went on Facebook and asked my FRIENDS and FAMILY – people I love, respect, and value – why they were opposed to gun control. What I found was that almost none of them were opposed to gun control. I found that we all agree on several tenets and I gained a new insight into the gun debate. There were concepts and words that I had misunderstood. I had made some inaccurate assumptions. The conversation completely changed my feelings about gun owners. It did not change my opinions about my friends, because I already loved them, but it did humanize the argument. I know that a majority of Americans are just normal people, doing the best they can – but politicians don’t really want me to believe that. The result of this unplanned experiment has been interesting. First of all, it has made everything more difficult for me. The world is less black and white and I’m really struggling with where I stand on some key issues. I have found that some of my very liberal friends are turned off by this approach. There seems to be a growing sense that now is the time to draw a line in the sand and to “stop being polite.” I agree that there needs to be a time when the fight for what’s right might get ugly. It won’t be polite. It will be violent, angry, and possibly misunderstood. Consider sit-ins, walk outs, strikes, protests, and boycotts. I know that social change is difficult and messy and often violent, but I also know that people on both sides are mostly good people. So how does one reconcile this age of change and progress that is also an age of anger and insult? I don’t expect a Parkland survivor to be polite, but I also know that naming all 6 million NRA members as terrorists is wrong. Where is the happy medium? How does one participate actively in change, but remain free from vitriol? How does one stand up to the divisiveness of our current politicians, but also refrain from using the same polarizing language? God, I don’t know the answers. What I’m left with is Brown’s remarks about focusing on the individual experiences. I am only one woman and I do know that I can (possibly) affect the lives of those around me and my children. Maybe that’s not enough, or maybe that’s something. I really don’t know, but I do know that it has the feeling of action. It feels as though I am not simply standing idly by. I am resisting, but I am doing so on my terms and with integrity. I may only affect my household or my social circle, and maybe not even that, but I’ll grow old knowing that at least I tried to do something. ← Should I go into teaching? What should we tell the next generation?